I just came back from a really enlightening conversation about life and relationships in general to a dark house and picked up two pieces of mail – one was for my car insurance premium for RM 1,704.60 (=_=!!!) which I have to pay before next month and the other was a padded largish envelope. 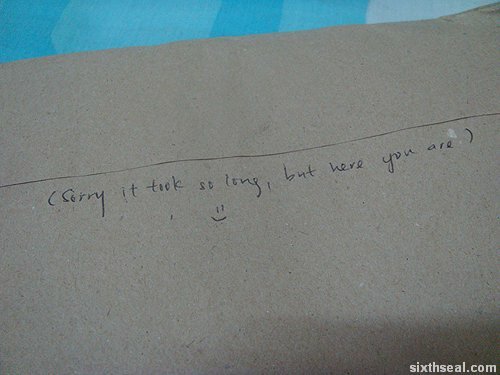 The writing at the back says “Sorry it took so long, but here you are”. 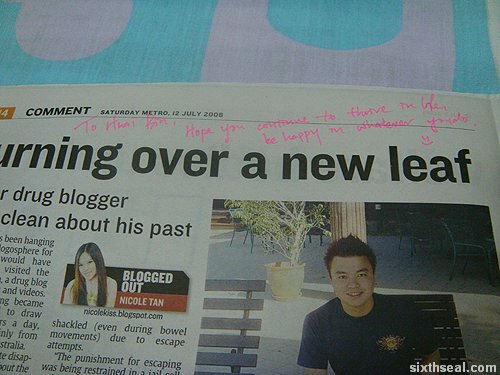 It’s the autographed copy of The Star from two months back with a feature of me by Nicole on sixthseal.com. I have read the article in the online version of The Star and was surprised at the more positive key in the actual paper. The front page Saturday Metro text has “Drug blogger turns over a new leaf” which is a much better angle than the “Former drug blogger comes clean about his past” headline that the online version features. 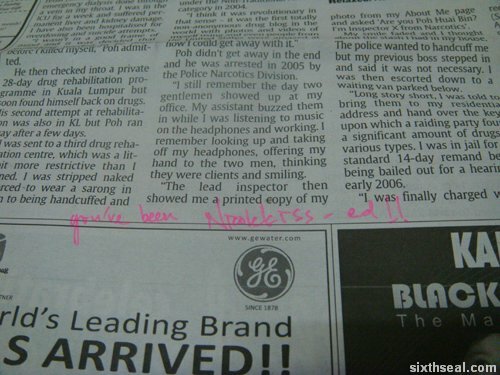 I asked Nicole for an autographed copy of the paper and she finally got around to sending it to me. ;) The article is an interview about sixthseal.com and my experience as a drug blogger in the past and how I’ve turned my life around. Thanks for sending me the papers Nicole, much appreciated! I like the article in the off-line version, it’s much more positive.